Around a hundred people attended the Glen Lake Community Schools board meeting. Most public comments were about a culture of fear, low staff morale and teacher dissatisfaction. 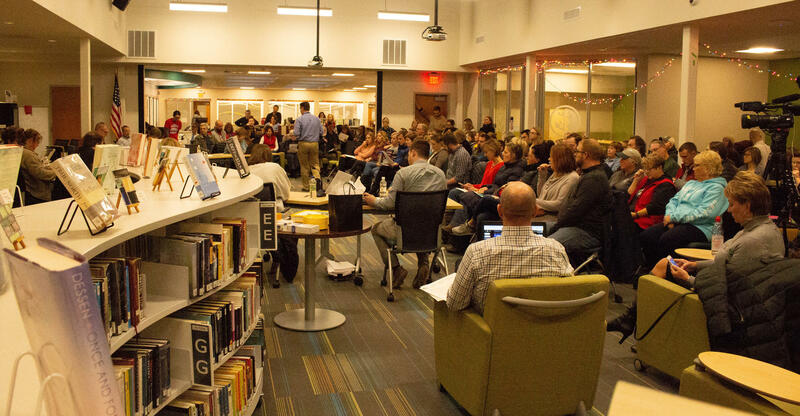 A culture of fear was at the heart of a board meeting for Glen Lake Community Schools Monday night. There were around a hundred people in attendance and most public comments addressed the culture and teacher dissatisfaction in the district. Timothy Young, a Glen Lake parent, told the board he got a sense of employee complaints at a private meeting earlier this month. The issues have come to a head as teacher contract negotiations have dragged on for 11 months. So far this school year teachers have worked without a contact. 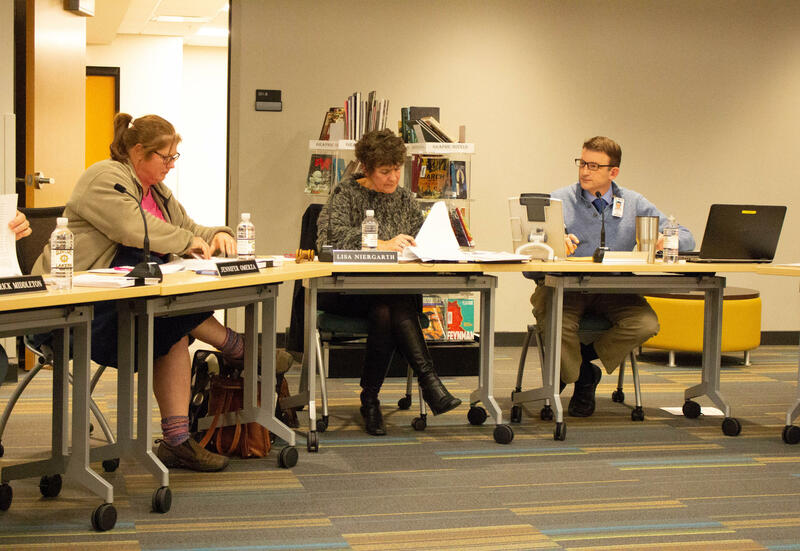 “I do think that the fact that we still do not have a settled contract is my biggest failure in my 25 years of serving students in public education,” said District Superintendent Sander Scott. Board President Lisa Niergarth (middle) and Superintendent Sander Scott (right). Scott set the tone of the meeting by acknowledging that his staff and the board are hurting. “I am deeply sorry for my part in that,” said Scott. He said they are facing a number of problems and are “a district at the edge.” Scott told the board and audience that a number of things have created this perfect storm: the unresolved contract negotiations, his push to reduce expenses by cutting positions, employee turnover and unnecessary legal conflicts. Paul Christiansen, a retired Glen Lake teacher and coach, said he’s troubled by what he has heard. Scott presented a number of ways he plans to do that. He said he’ll be more involved going forward. “I think it’s time for Sander [or] a board member to get in a room with the [teachers union], pizza and pop, and don’t come out till the deal is done,” said Scott – which was met with applause from the audience. To address broader cultural issues, Scott said he has begun privately meeting with a teacher representative to address specific complaints. He also stated he will not be cutting positions to tighten the budget – something he had previously set in motion. “What I didn’t appreciate nearly enough was the stress that that was going to put on our team,” Scott said. The board is planning a community forum to discuss the district culture. A date has not been set yet. Superintendent Scott faced criticism for his alleged behavior as an associate superintendent of Traverse City Area Public Schools. But an investigation found no evidence of gender-based discrimination or retaliation by Scott and his colleagues.